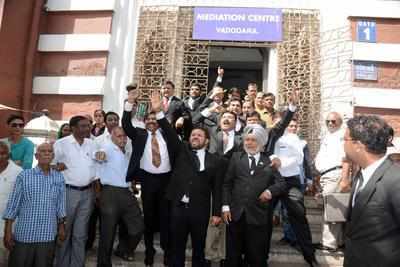 Vadodara: Over the alleged insult of lawyers by a police constable of Raopura police station in an audio clip, Baroda Bar Association members on Tuesday decided to stay away from the proceedings of courts for two more days. The Baroda Bar Association had stayed away from the proceedings of courts on Tuesday, a day after the audio clip became viral among instant messaging groups of lawyers. But, on Tuesday in another meeting called by the office-bearers of the association it was decided that the lawyers of the city as well as district will stay away from the court proceedings. The association has also decided to make representations to city police commissioner Manoj Sashidhar and ask him to take action against the constable who insulted the lawyers. On Tuesday, the lawyers protested outside the civil court and shouted slogans against police. However, the routine work of production of accused in court and request for remand went on.